Mary Polityka Bush's delightful and diminutive pincushion, as featured in PieceWork March/April 2015 issue is now available for you to create for yourself with our exclusive kit! Mary Polityka Bush’s delightful and diminutive pincushion features a realistic straw hat that would have been a favorite pincushion shape during the Victorian era. 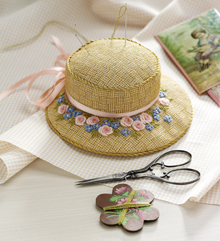 Now you can create this beautiful pincushion for yourself with the Petit Chapeau Pincushion to Embroider Kit. Welcome to our special Projects Issue! Inside, you’ll find sixteen projects from an amazing team of designers worked in a wide variety of techniques, from knitting to needlework and tatting. Each is accompanied by an introduction that sets the historical context. 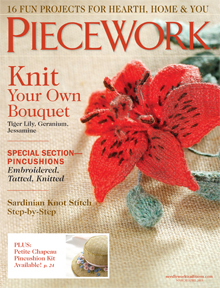 Included in this issue are the instructions for the Petite Chapeau Pincushion to Embroider. This diminutive pincushion in the shape of a woman’s summer straw hat would have been keenly admired in the Victorian era, when novelty pincushions were trendy and enthusiastically collected. Like many basic straw hats, this scaleddown version can be trimmed in various ways: with the embroidery shown or with ribbonwork, beading, or purchased silk flowers. Finished size of the pincushion is 15⁄8 inches high x 4½ inches in diameter (4.1 x 11.4 cm). 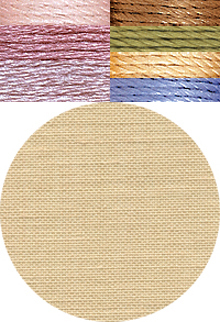 Order the A Petit Chapeau Pincushion to Embroider Kit today!